After the rather short" time of seven years we are proud zu present the next music release on FRee-K Sounds. It is a Creative Commons music set performed by DJ Robb as live mix in his regular show Make Rave, not Hate. The set was played on air at the end of July at Freies Radio Kassel, Germany. 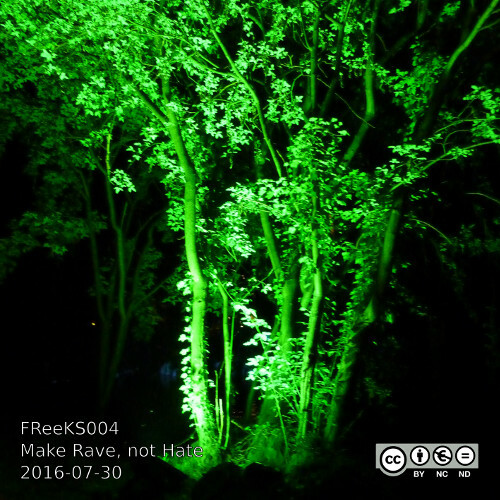 The dj-set DJ Robb – Make Rave, not Hate 2016-07-30 has the label code FReeKS004 and is released under the terms of the CC license by-nc-nd. It has a play time of two hours and is released in lossy MP3 or Ogg Vorbis as well as lossless FLAC – see the Archive.org page for details; they have also a nice PDF cover image. Ich erlaube FRee-K Sounds News das Speichern obiger Daten . Bis auf den Kommentartext sind alle Angaben freiwillig, neben dem Zeitpunkt des Kommentars werden keine weitere Daten gespeichert. Weitere Informationen findest du in der Datenschutzerklärung.